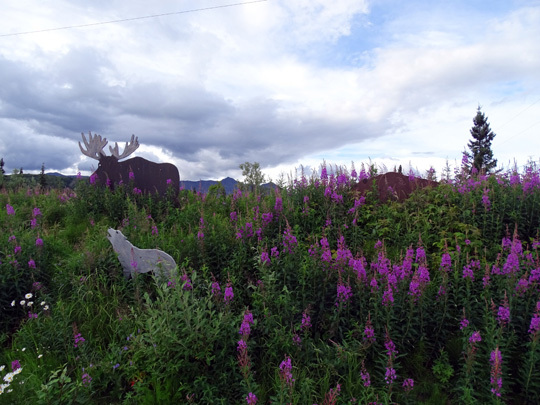 access to Denali National Park and Preserve from either Anchorage or Fairbanks. 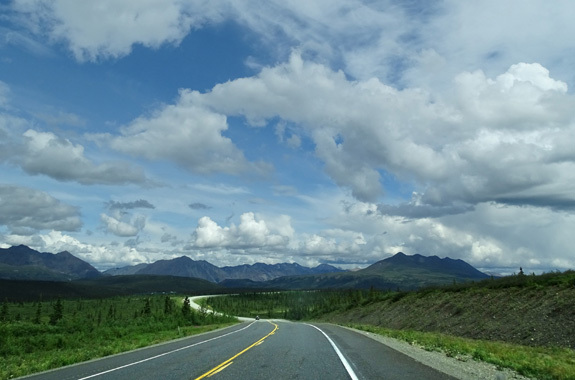 Although we saw Denali from several viewpoints along the Parks Highway three years ago (next photo below), the clouds were too low to see it yesterday when we passed those points. Note that I always call the mountain by its Athabascan name, Denali, and not Mt. McKinley. There has been controversy over the name for decades. 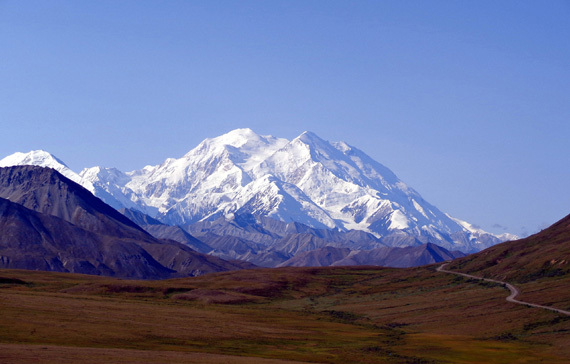 Almost every year there is a debate in Congress to make "Denali" the official name of the mountain. I hope this year it will finally pass legislation. and glaciers of Mts. 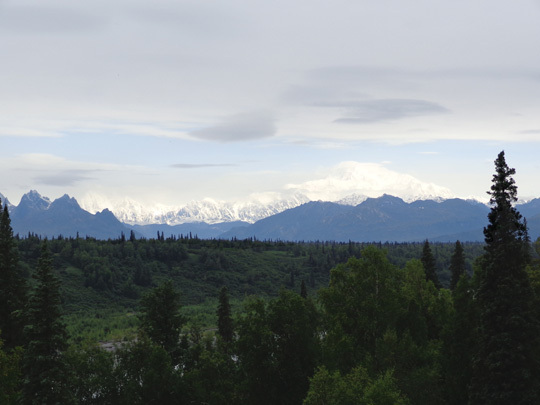 Foraker and Hunter were visible from the South Viewpoint. Yesterday morning we left the Grand View RV Park and drove west on the Glenn Highway to Palmer, where we turned north on the Parks Highway. 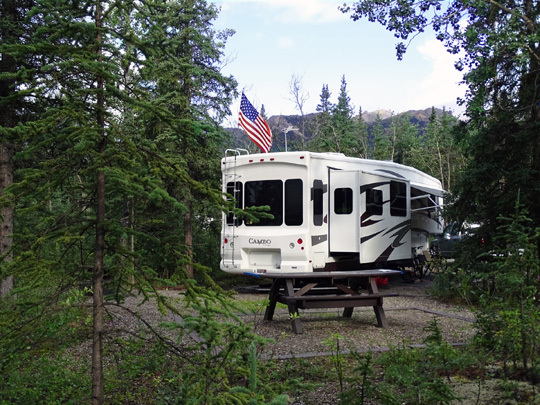 Since our reservation at the Riley Creek Campground in Denali National Park didn't begin until today, we stayed overnight at a private campground in the town of Cantwell about 25 miles south of the park entrance. We completed the trip to Denali NP this morning. 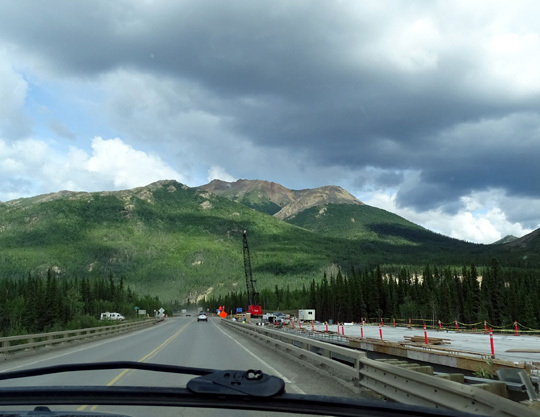 This entry chronicles our two-day drive through some beautiful Alaskan scenery -- even when the sky is overcast or it's raining. more colorful when we go back to Anchorage in two weeks because the blooms haven't peaked yet..
We drove the majority of the way to the park yesterday, positioning ourselves for an early arrival at Riley Creek CG this morning. We learned when we were here three years ago that people come in earlier than the 11 AM arrival time and get the bigger campsites. With a 36-foot 5th-wheel and truck, we need one of those. 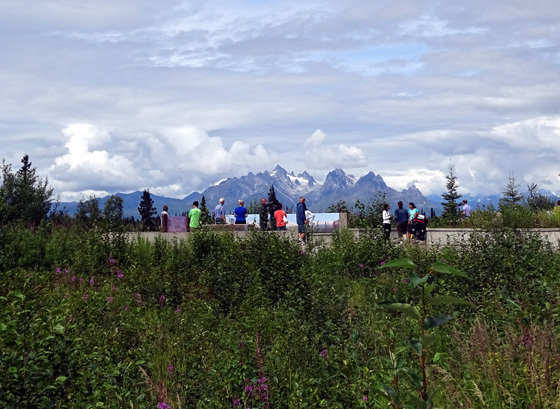 With several road construction delays, getting diesel in Palmer, shopping at the super WalMart in Wasilla, and stopping for photos at the south Denali Viewpoint at MP 134 on the Parks Highway it took us 5� hours to drive to Cantwell yesterday. 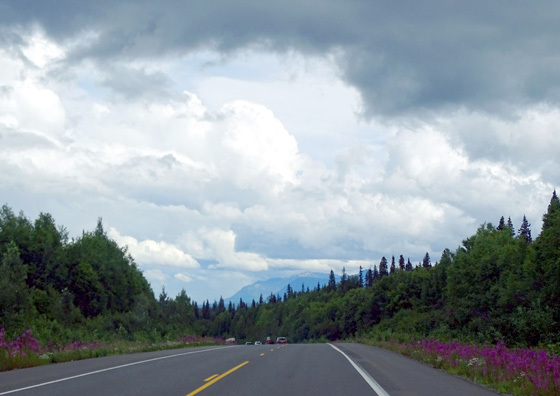 Although it was overcast and we couldn't see the tops of all the Chugach and Talkeetna Mountains along the Glenn Highway, the drive began well. The next nine miles are still being paved and were OK since we got to drive on the new asphalt. At Palmer we turned north onto the Parks Highway. Traffic was heavier through Palmer and Wasilla but thinned out by the time we got to Willow. Traffic got congested again in the next work area between MP 123 and 146. There was a sign warning drivers to "expect long delays" but we didn't have to wait any longer than a few minutes for a pilot vehicle in two parts of that section. Some of the road was paved and painted, some paved with no paint yet, and some still being paved. 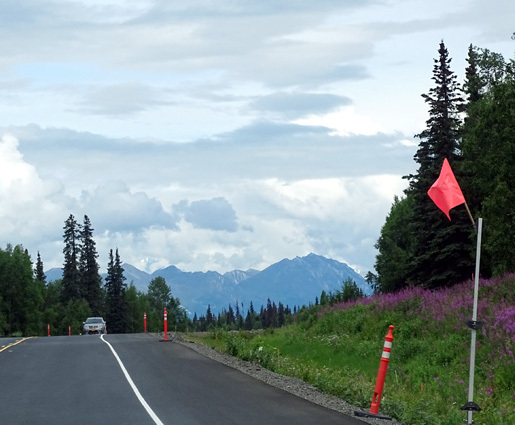 Alaska Range -- and more road work -- ahead. We were dismayed to see the extensive damage from the "Sockeye" wildfire in the Willow area several weeks ago -- and all we saw were blackened trees (and some houses) along the Parks Highway, not off the road where even more devastation occurred. Eighteen square miles of forest and residential property were destroyed, including more than 50 houses and 40+ other structures. We've been hearing about this fire since we arrived in Alaska. 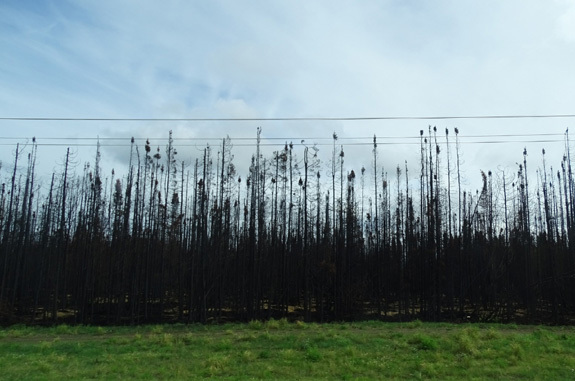 Skinny lodgepole pines are even less attractive when burned to a crisp. Today the state finally released the cause -- two people burning brush improperly at their cabin near MP 77 on the Parks Hwy. They live in Anchorage and are charged with a bunch of different misdemeanors and felonies. They could be held liable for twice the cost of suppressing the fire ($8 million x 2) and face jail time. 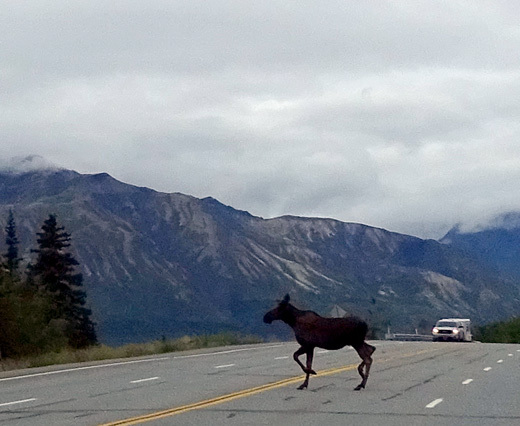 This is a good article from Alaska Dispatch News. The perps allegedly knew they had started the fire but didn't call 911 or come forth with details until interrogated later. They apparently fled the scene in their motorhome. No people were killed but many pets reportedly lost their lives, many homes were lost, and many people lost considerable land value. I would be extremely upset if I'd been one of the victims. It sounds like these perps had no conscience or sense of right and wrong after they started this massive wildfire and thought they could get away with it. I'd love to be on that jury. It's OK but we were disappointed by this private campground -- just not worth the cost to us ($30.50 plus tax and minus 10% discount for military, Good Sam, etc.). The water connection was so far to the back that Jim didn't hook our longer hose to it. It's buried in the basement behind or under two new 35# bags of dog food. He found it easier to add 12 gallons of water from containers to the fresh water tank than to dig out the longer hose. We had 30 amps electricity. There was no sewer or cable. The WiFi didn't work with the campground almost completely full but our Verizon phone and MiFi signals were strong. 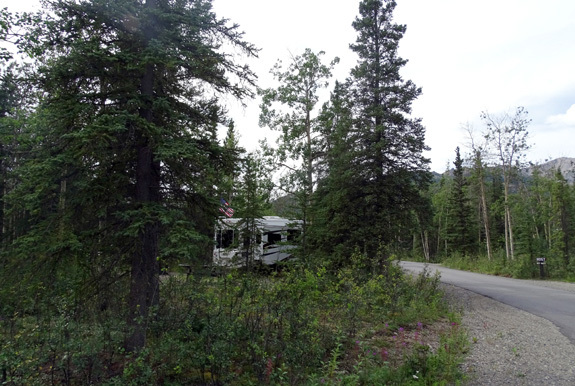 After we got set up we drove just the the truck to Denali National Park to check out the situation at Riley Creek Campground, our next destination. We got back to Cantwell about 6 PM, ate dinner, and walked the dogs. He also talked with a retired Army guy who was a helicopter pilot in Viet Nam when Jim was there. He and his wife were at JBER the same time as us but they were on the Elmendorf side and we didn't see them there. While he was walking around Jim overhead a man telling someone else about his bus ride in Denali yesterday. 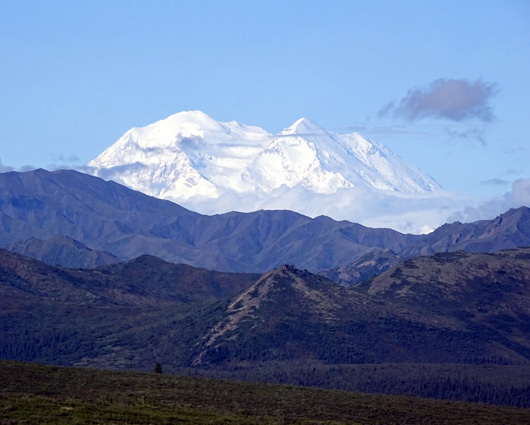 The bus driver told his riders that it was the first he's seen Denali-the-mountain in a week. 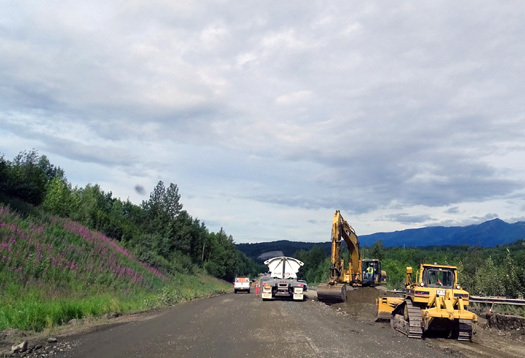 In addition, he mentioned that construction starts on the road in the park -- not just on the Parks Highway outside the park -- each morning at 6 AM. That must be a real challenge for all the park and private tour buses. 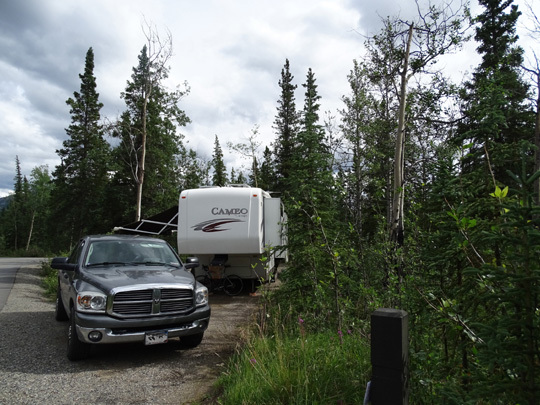 After we got set up in the campground in Cantwell yesterday we drove the truck to Denali NP to check out Riley Creek Campground. We have a reservation for one of the larger sites but they are first come, first served and we wanted to see which ones would be available this morning. On the way up to Cantwell we debated about just driving to Riley Creek in hopes of moving our reservation up one day. It's a good thing we decided to go ahead and stay in Cantwell because Riley Creek was completely booked last night. 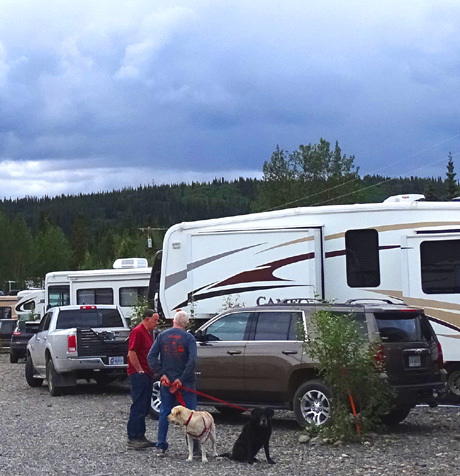 Once inside the park late yesterday afternoon we drove through the paved Bear Loop at Riley Creek Campground and noted the sites that would be available today that are large enough for our RV -- the "A" sites for rigs up to 40 feet long. We wrote down which ones were single wide, double wide, and supposed to be vacated on June 14. The three sites we occupied in 2012 are either taken for a few days or unavailable because they are disabled sites (the rules for those are more strict this time). The Bear Loop is paved and half the sites are large enough for our rig -- if they are available. 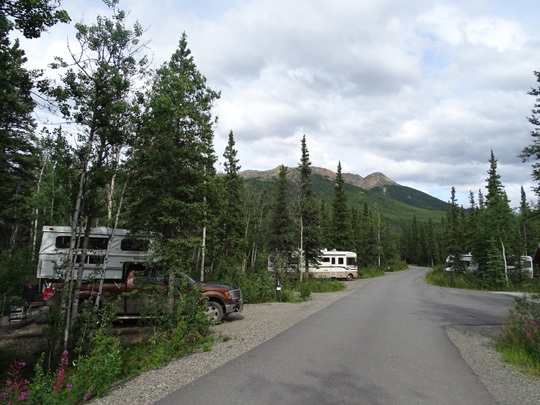 We drove around the other two campground loops at Riley Creek to see if there are any other suitable "A" sites but the roads there are rough, narrow, dirt-and-puddles, the sites are too small for our rig, and the trees are too close to maneuver or open our slides. They are fine for small rigs. We were able to check in and got the cards for our campsite posts for the two times we're at Riley Creek and one time at Tek during this visit, plus my Tek pass for the buses, but we couldn't choose a site until we got here this morning. We left the RV park in Cantwell about 8:30 this morning. 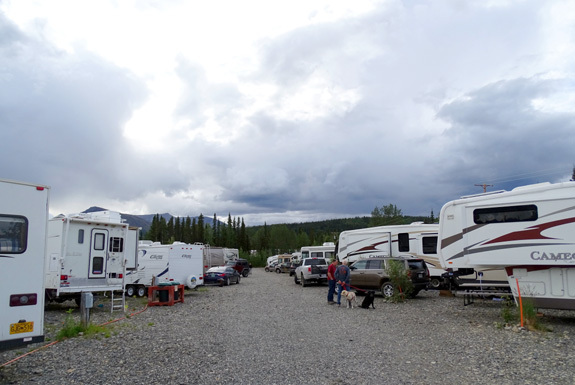 It took over an hour to drive 27 miles on the Parks Highway to Riley Creek Campground with the camper because of the rain and all the road construction. I can't believe they're excavating, filling in dirt/rocks, and paving in the rain! We had to wait eleven minutes at the first stop, then rode over new smooth pavement for a couple miles. The second work zone was about six miles from the park entrance. The wait was about eight minutes there. 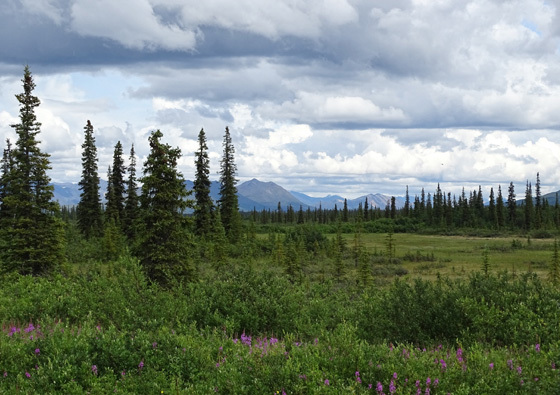 This was not the weather we were hoping for on our first day in Denali National Park! When we arrived at Riley Creek this morning we immediately drove through the Bear Loop with the Cameo in tow to see exactly what "A" sites are available today. A few we considered yesterday are now filled for one or more days. Two were already empty that were vacated this morning; we noted three yesterday. One still had a small Class C motorhome in it that must leave by 11 AM. They should have been in a "B" site for rigs under 30 feet, but that's another issue. Since there are no water or electrical hookups at any campground in the park, Jim dropped me off by the Bear Loop hosts' sites and went to dump our black/gray tanks and fill the fresh water tank near the Mercantile building adjacent to the campground. I asked Fritz, the on-duty host, about using one of the two empty "A" handicapped sites. Three years ago we were able to use two of those sites because none of the others were large enough for our rig. Fritz, however, said absolutely not unless we have a handicapped sticker. OK, that's only fair. I looked at the three choices we had in the Bear Loop again and chose the one across from the campground hosts. I put our reservation card on the post and waited for Jim to come back with the Cameo. Fortunately, the site is larger than it looked when empty. Jim was able to get into it easily since he could see it from the driver's side while backing in. There is plenty of room in front for our truck and lots of privacy on both sides and the back. We can get online at our site just fine with a good phone and MiFi signal. If we want free WiFi we have to sit outside the Mercantile or other buildings in the park. No problem. With our NPS senior pass we're paying just $14/night (half price) for a beautiful, large, quiet site in the spruce trees. It's nice to be able to open our blinds during the day and not have to worry about other people seeing in because they're just a few feet away. I took this shot on a sunnier day. Despite the intermittent rain and chilly temperatures (high of only 51 F.) we accomplished a lot this afternoon in addition to getting settled into our new home for the next five days. We ran errands at the Mercantile, Wilderness Access Center, and main visitor center in the park. I also signed up for a guided Discovery Hike tomorrow 60 miles into the park (a little before the Eielson Visitor Center). I've never done one of the off-trail guided hikes before but they sound like fun and the weather is supposed to be nicer. Denali's north and south peaks are clearly visible in the distance. Jim rode the bike with Casey and I walked Cody around the three campground loops between rain showers. 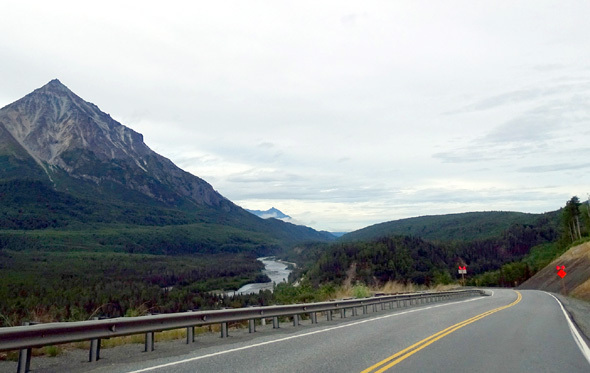 Everyone took short naps, Jim and I got online to check news and weather, and we all took a drive north on the Parks Highway about ten miles to the town of Healy, where we got diesel for the truck. There is no diesel in Nenana Canyon just outside the park and the price was much cheaper in Healy than in Cantwell (still expensive at $3.63/gallon, though). 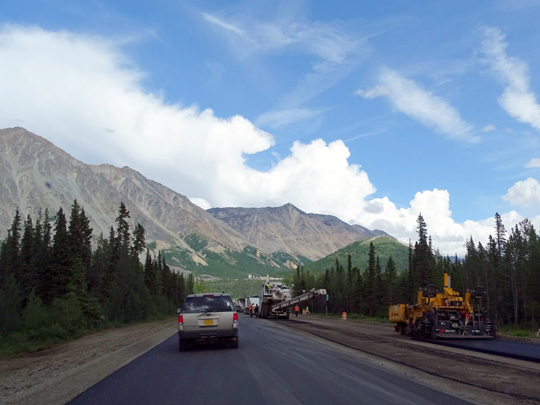 There are three more areas of construction on the Parks Highway north of the park that we didn't see yesterday. What a mess!!! We were glad we were in just the truck and not towing the Cameo. 1) Another bridge and new lanes beyond the park entrance toward Nenana Canyon AKA Glitter Gulch; the road is excavated down to dirt. 2) Another section of road just north of the Gulch that's down to dirt, where we had to wait over 20 minutes going NOBO. 3) A third section farther north that's longer but had more new pavement for us to drive on. That wait was shorter. 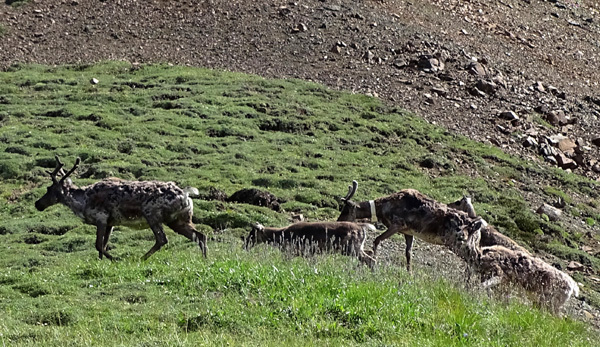 they were part of two large herds we could see coming down one mountain and going up ours. On the way back to Denali we had only about five minutes total delay. Glad we won't be going that way this month with the camper. We're coming back here in late August and have fingers crossed that all this roadwork is completed by then. I hope next year's visitors appreciate all the inconvenience this year's visitors have! We're glad we'll be in the park for two weeks because there's a fighting chance we'll see some sun within that time period. We feel sorry for tourists who are here, especially from other countries, for only one or two days. 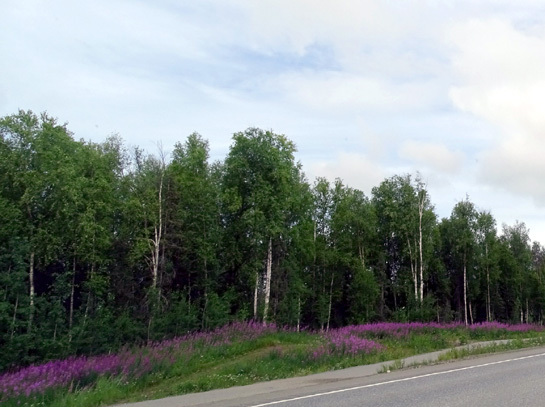 Not only do they have to contend with the annoying road work in and on their way to and from the park, they also have to deal with frequent rain and low clouds in the summer. 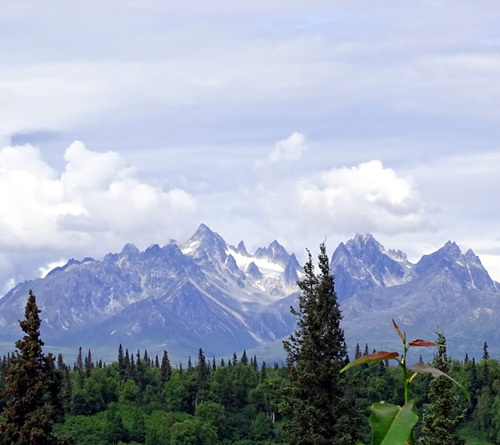 I seriously doubt anyone saw Denali today, or even any scenery above 3,000 feet in the foothills. At least the forecast for tomorrow is for sunshine.